Semi-fitted, shaped, & dropped waist bodice, zips in back. Gathered sleeves are above elbow & have a taffeta rose on each sleeve. 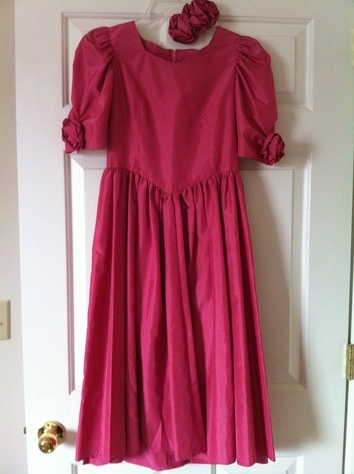 Dress is completed w/flared skirt layered in the back w/taffeta roses at back waistline. Comes w/matching taffeta rose barrette.